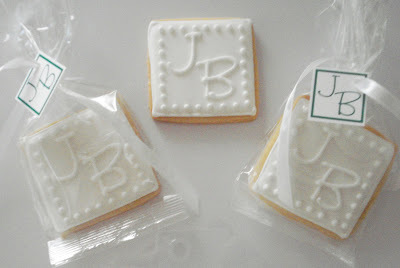 Elegant white on white wedding cookies: Cookie Exchange! These cookies were made by Bea of Cancun Cookies. Bea has many darling cookies on her blog, but when I saw these, I had to ask if she would let me feature them here. I love the white on white design of the monogram...so elegant! Didn't she do a perfect job matching the cookie lettering to the invitation font? And, I love the dots along the border!!! Thank you, Bea, for being a part of cookie exchange! OMG, Bridget! Thank you for featuring my COOKIES in your blog!! You are so talented, that being here makes me feel special :) Have a nice day! I already told Bea how much I liked these cookies, so simple, yet so elegant!!!! Those do look splendid. You're right she did match the lettery up perfectly. I wish I had the patience. Those are beautiful. I'm loving all of the bakery artists! Oh how lovely! Cute idea! Just nominated you for a blog award. Check it out. Seriously, I swear I gain 5 pounds everytime I read your site. You are so talented. These are so very beautiful and elegant. I love checking in on you to see what youve been up to. Bea is a great cookie artist. Or whatever you want to call us cookie ladies! I thous cookies..Really I like the presentation of thous cookies.. Thanks for sharing this blog..